Otto H. Sollan, an old veteran, brought here from the Soldier’s Home at Grand Rapids, last August, died Monday night in the asylum hospital from a stroke of apoplexy. He was 64 years of age and had been bed-ridden throughout the five months of his stay. Nothing is known here regarding his past life. The remains accompanied by relatives will be taken to Grand Rapids today for interment in Soldier’s Home cemetery. I again take up the pen to write a few lines to you. Your last letter of the 26th ult. was received and read with much interest. I was very glad to get a letter from you as I did not know what was the trouble that I did not hear from you for so long. I am, thank fortune, in right good health and in good spirits. Everything is going off very smoothly. My Company’s business is getting everyday more overhauled and in better shape. I have since the 1st of January ’65 procured orders for the reinstatements without trial of 11 of my men who were all charged with absence without leave and desertion, but who have been with the company for over 1 year and a half without trial and good soldiers at that. The substance of their crime being that the hungry land sharks — the provost marshals — wanted to make a little by watching men who could not go back to their commands on account of sickness at the expiration of their furloughs. The Captain of my company ¹ has just been heard from. He is at home on leave of absence. He has just been paroled and I expect to see him soon. I shall be glad when he comes so as to relieve me from considerable responsibility. Today is Sunday and is a very fine day. The peach blossoms are out in full bloom and the grass is out nice and green. Summer has commenced here. We have just invited our chaplain ² to resign his office and go home as he is getting rather odious to the worst of us. He gave orders for at least 2 gallons of whiskey in 1 day. Spoke in favor of spiritualism that night and went hunting on the next day (Sunday) — and the same night beat the post commander at cards for the whiskey. He is a Campbellite preacher, by profession. As a general thing, chaplains are a very great nuisance in the army. You wished to know how long I had to stay and when my time was out. I cannot tell you to a certainty myself when I enlisted in the regiment. I enlisted July 24th 1862. The regiment was mustered into the U. S. Service on the 16th of August 1862. If I had stayed in the ranks as an enlisted man or under officer, my time would be out on the 16th day of August 1865. But I was discharged as you can see by my papers in May 1864 and again mustered in as a commissioned officer the last time as 1st Lieutenant on the 1st of September 1864. Now they would muster only for 3 years or during the war and so I had to be mustered as such. However, they have in other regiments where there are cases like mine issued a special order to muster out the whole regiment, officers and all — and so I expect to go out when my regiment does. I received the package of quinine you sent me but have as yet used none of it. I send inclosed a picture of Corp. Robert Crandall ³ — a wagon maker of Plymouth, Indiana. He was discharged from this company on account of the loss of his right arm. Save the picture for me. I must close for this time. Write soon. 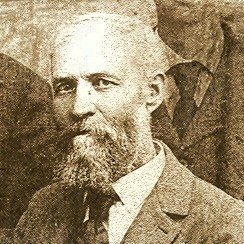 ¹ Horace Gamble was the third captain of Company F, 73rd Indiana Infantry. He was from Plymouth, Indiana. 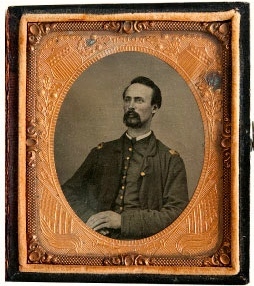 ² Chaplain John A. Frazier served with the 73rd Indiana Infantry from 26 February 1863 until 1 April 1865. He was from Laporte, Indiana. This entry was posted on Friday, October 10th, 2014 at 1:26 am	and posted in Uncategorized. You can follow any responses to this entry through the RSS 2.0 feed.